I first became familiar with the Bergstrom's when I started stalking their blog a few years ago. 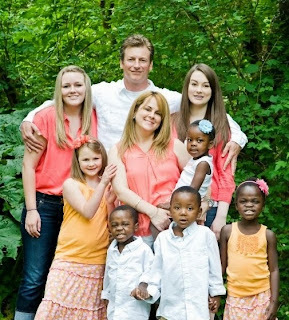 They were a family with 3 beautiful bio girls and a sweet princess from Congo. They were some of the pioneers of Congolese adoption and I was eagerly following in their footsteps as we began the journey to bring Haven home. A little over a year later and we were together in the adoption journey again. They were bringing home a son and we were waiting on Manny and JoJo. This is one of my favorite first pics of my boys. JoJo is in blue and Manny is that tiny little thing in pink! Chelese is in the middle. It was so amazing to get first hand reports about my babies. Within a few months the Bergstrom's were a family of 7 and we were a family of 6. I never imagined I would have almost as many kids as Chelese! About a year later we were at it again. Chelese was one of the first people I contacted when I started to get adoption fever again. I knew she wouldn't call me crazy when I told her I wanted to go back to Congo for a baby girl. And of course, I didn't think she was crazy when she told me she wanted to go back for two more :) So we supported each other through the wait for Kat and Louise and her new boy and girl. The Bergstrom's were now a family of 9. Throughout all these adoptions, Chelese and I had never met face to face. We expected to travel together on our last adoption, but we ran into some delays with the girls paperwork. She and Brian crossed paths for a few days in Kinshasa, but I never got to meet her until this summer at our crazy impromptu Congo reunion in Florida. When I finally got to squeeze her neck this summer she was once again in process to, you guessed it, adopt once more from Congo. She had just gotten a referral for two gorgeous boys, brothers in need of a forever family. Well, this is one heck of a family! Hopefully, very very soon, the Bergstrom's will be a family of ELEVEN! What a lovely number!!! I know well how hard and expensive this process is and the Bergstroms have been saving and scrimping and selling anything that wasn't nailed down to raise the funds to bring home their boys. I wanted to help, but with six of our own there's not much money laying around our house except for the loose change in our couch. And that might actually be Monopoly money. 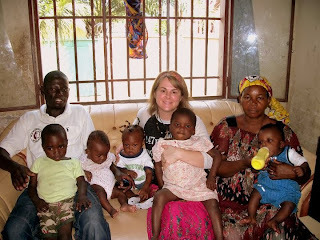 So I came up with the idea to sponsor Chelese and her boys through the More Love Mama shop. Starting on Saturday, September 21 and running through Monday, September 30, if you make a purchase at the More Love Mama shop and you leave a note at checkout with the name BERGSTROM, I will donate 15% of your purchase price (not including shipping) to the Bergstrom Family Adoption Fund. So for instance, if you purchase one of my African Wax Print blankets for $50, the Bergstrom's will be given $7.50. Even better, I will be donating $5 from the purchase of each red and white MORE LOVE t-shirt. The t-shirts sell for $20 apiece so that is 25% of the price going to support this amazing family! I am so excited to be able to play a small part in making the Bergstrom family a little more complete. So come on over to More Love Mama! Start your Christmas shopping this week and help two little boys find their way home. We'll be sponsoring more families in the coming weeks. So stayed tuned and help us spread a little MORE LOVE!! !